These BigAir Trampoline Sessions will be a well rounded air awareness, core strength and conditioning program for all levels and even board sport athletes. Not only will you learn the stronger basics of BigAir (straight airs, grabs and spins), you will have a great time learning how to crash hard with style. Gymnastic foam pits, crash pads and tumbling mats are a fun time, especially with skilled coaches, that are very experienced with crashing. Dave Valenti, “Oughta Know”. Dave has crashed all over the world flipping twisting, skiing moguls, pow shuts, dropping cliffs you name it he has crashed on it, he skis OK sometimes. 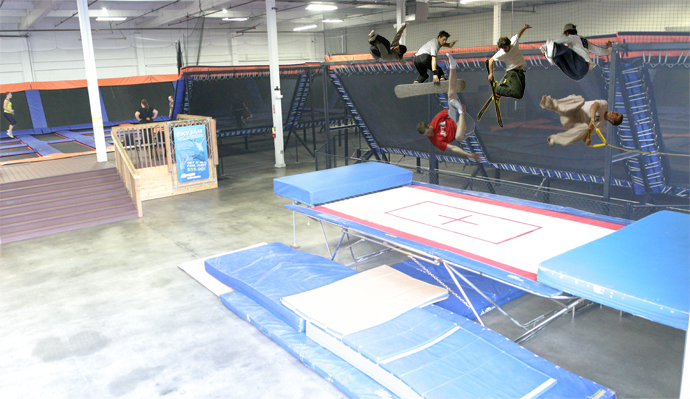 Come have a great time at SkyMania Trampolines and try the BigAir Trampoline Conditioning Camps Styling it Smart with Dave Valenti. The property that housed Skymania was purchased to build condos and apartments in Kirkland. Check Facebook for Big Air Training in Dave’s Backyard Training Center periodically. Dave has always had trampolines in his backyard and has given lessons.